Gloria peacefully passed away on Sunday, January 6th surrounded by loved ones. She was born on April 28, 1928 to Fred and Grace Dubendorf, the 9th out of 11 children, in Lansing, Michigan. She married Robert Corey on May 6, 1950. They lived most of their married life in Grand Ledge, Michigan. Gloria loved to play golf, and for many years she and Robert were members of the Portland Country Club. They later joined the Grand Ledge Country Club where Gloria proudly shot a hole in one. In July, 2003, after having spent many winters in Florida, Robert and Gloria decided to move permanently to Brooksville, Florida so they could enjoy playing golf year round. Gloria was an excellent bowler and spent many years on a bowling league with friends. Gloria loved to sew and knit, and she taught her three daughters to do the same. She also enjoyed being outside in the sunshine and warm weather. Gloria loved music and dancing, and her smile could light up a room. 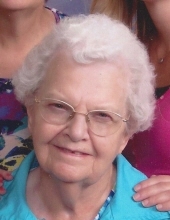 She adored her grandchildren and rarely missed being at one of their events. While Gloria had various jobs throughout her life, her greatest joy was taking care of children and many were lucky to call her “grandma”. Gloria was preceded in death by her parents and 9 of her siblings. Gloria is survived by her husband of 68 years, Robert, and by her three daughters and sons-in-law, Linda and Rick Merrifield, Ann and Doug Wagner, and Susan and Edward Piercefield. She is the beloved grandmother of 9 grandchildren: Erin (Brian) Nimphie and Sara (Michael) Bell; Corey (Samantha), Stefani, Jacob (Rebecca), and Benjamin Wagner; Bonnie and Aimee Katalenich; and Steven Corey. She is survived by her five great grandchildren: Grace, Evalynne, Easton, Lauren, and Leo. Gloria is also survived by her loving sister, Patricia Brewbaker. She leaves behind many nieces and nephews as well. To send flowers or a remembrance gift to the family of Gloria E. Corey, please visit our Tribute Store. At deceased request, no service will be held. "Email Address" would like to share the life celebration of Gloria E. Corey. Click on the "link" to go to share a favorite memory or leave a condolence message for the family.